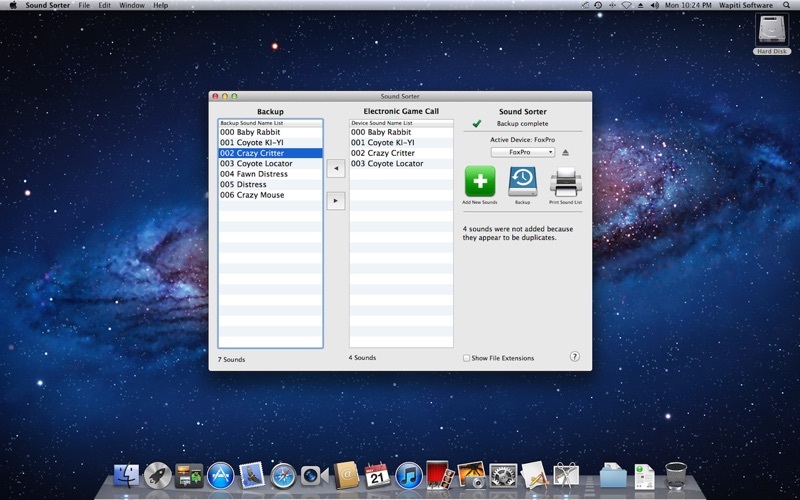 A FoxPro game call sorting utility is finally available for the mac! If you own a FoxPro electronic game call then this is exactly what you have been waiting for. Easily sort, rearrange, backup and add new sounds to your FoxPro game call. You can even print a list to take with you in the field. Please note: This app will ONLY work with FoxPro electronic game calls. Your FoxPro device has several, sometimes complicated, requirements for your sound to work properly. This app takes the headache out of keeping up with all those requirements by incorporating the following great features: Automatically saves your work Automatically renumbers the sounds Ensures only compatible file types are used Automatically follows the FoxPro naming convention Our number one priority is you, our customer, and your user experience. If something doesn't work quite as expected, please allow us the opportunity to make it right! Happy Hunting! Finally a FoxPro app for the Mac! It does exactly what it's supposed to do. Very simple and straightforward. I like that you don't have to save anything when you're done. It automatically saves and renames in real time. It takes me 2 or 3 minutes to do what used to take over an hour with the regualr work around for the mac. Easy to transfer sounds back and forth and rearrange the order. Finally I can organize my FoxPro with my Mac! Simple and easy to use! Thanks! This is perfect, exactly what I needed. I can now use my Fox Pro with my Mac.